For over 5 years I have been baking my son’s sandwich bread, adjusting and adapting to my changing kitchen and lunch needs. Today’s recipe re-ingrates whole-wheat flavor back into the loaf. I looked at this old wheat sandwich bread, recipe from Chris Kimball; but reduced the wheat germ by 50% to soften the over-powering flavor of wheat germ (a flavor my kids don’t enjoy). Also, I adapted the recipe to skip the 24-hour timeline; this recipe finishes in about 2 hours. 4-1/2 stars; still working on getting seeds to stick to the top. Start time 6:00 PM. Dinner time 8:10 PM. Adjust an oven rack to low-middle position, and pre-heat oven to 200-degrees, then immediately turn it off. You will use the residual heat of the oven to speed the first rise in a cool kitchen. Add water and milk to a Pyrex measuring cup (at least 2 cup capacity); heat in microwave for 1m until mixture reaches 105-degrees. Mix in yeast, sugar, wheat germ, and olive oil; allow to hydrate for 5 minutes. Spray your loaf pan with non-stick cooking spray. (I nearly ruined my first beautiful loaf by forgetting). Cover loosely with plastic wrap (realizing that the loaf will grow above the top of the pan). Place it in a warm spot in your kitchen for between 25 minutes to 35 minutes; until the dough has doubled in size and does not readily spring back when you poke it with your finger. Carefully remove plastic wrap, spray the loaf three times with tap water from a spray bottle, and place loaf pan in 425-degree oven. Set kitchen timer for 25 minutes corresponding to the total cooking time. 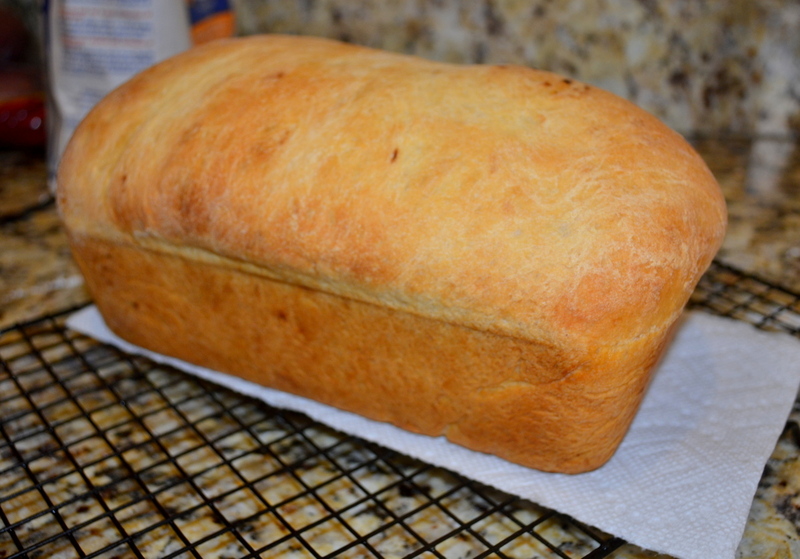 After 8 minutes, reduce oven temperature to 375-degrees and turn loaf 180-degrees. Bake uncovered for 9 additional minutes until the top crust reaches your desired color. Tent with aluminum foil to keep the loaf top from over browning; baking for remaining 8 to 10 minutes. An instant-read thermometer inserted into the center of the loaf will reads 205-degrees when the loaf is done. 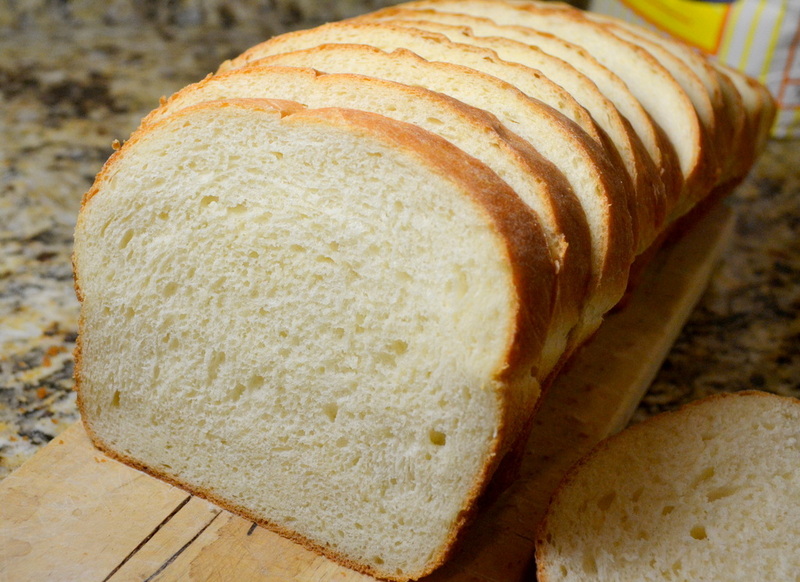 Carefully remove bread from pan, and allow to cool on a wire rack for 3 hour before slicing (ensure that loaf is no warmer than 80-degrees). While necessity has dictated that I make them on occasion, I have never loved biscuits. My heart lies with the wonderful flavor of yeasted rolls. Of course, chemical leaveners such as baking soda/baking powder have an advantage over yeast in that they are quick. But today’s biscuits take two full hours from start-to-finish; an hour of which is related to chilling the butter/dough to allow for the nice definition of the layers. As biscuits go; these are better than most. The flaky layers lighten the crumb, and they have nice buttery flavor. But biscuits are inherently dry, and they would have been better if I served them with a main course with gravy. 4-1/2 stars for the recipe; ignoring the flaws in my execution. I have made these biscuits on two different occasions (the pictures are from the second time that I made them). Because it was the second time, I wasn’t reading the recipe as closely and made to errors in execution that affected their flakiness and made them denser than the first time I made them. Still, even at their best they cannot compete with the texture produced by yeast. While the recipe calls for King Arthur’s flour; which has a slightly higher protein content along it’s entire line of flour; I used whatever flour I had on-hand. I did substitute one of the cups of flour for bread flour; but the biscuits will come out fine with 100% regular all-purpose flour. In Step 4, I forgot to grate the butter directly into the flour. Actually I made this recipe twice, and only forgot the second time. The results were not as flaky. In Step 8, After the fifth turn, I accidentally rolled it out into a 9×12″ rectangle again, so I ended up having to give it 6 turns. It resulted in layers being a little too thin (and not as well defined). In Step 10, when I trimmed the biscuits, I only trimmed them to make them edges uniform; not a full and uniform 1/4″. The results: where I trimmed away less than 1/4″, those edges did not properly rise and show their flakiness. Start time 4:00 PM. Ready at 6:00 PM. Freeze butter for 30 minutes. Meanwhile line rimmed baking sheet with parchment paper and set aside. After the butter is partially frozen, dip sticks of butter in flour mixture. Hold the box grater directly over the flour mixture and grate 7 tablespoons from each stick on large holes. The grated butter will fall directly into the flour; which will keep each grate as an individual piece. Gently toss to combine. Set aside remaining 2 tablespoons butter. Add buttermilk to flour mixture and fold with spatula until just combined (dough will look dry). Liberally flour a clean work surface, and turn out dough. Dust the surface of dough with flour, and use your floured hands to press dough into a 7″ square. Flour a rolling pin and roll into 9″x12″ rectangle (with the short side parallel to the edge of the counter). Use a bench scraper or metal spatula to fold the dough into thirds like a business letter. Press down firmly on the top of the dough to seal the folds. Turn dough 90-degrees and repeat Step 7 four more times (for a total of 5 folds). After the fifth fold, roll into an 8-1/2″ square (about 1″-thick). NOTE: Here is where I accidentally rolled it out and was forced into an extra turn. Move dough into the prepared sheet pan, cover with plastic wrap, and move to refrigerator for 30 minutes. Meanwhile, adjust a rack to the upper-middle of your oven and pre-heat to 400-degrees. I set my 2 tablespoons of butter (that you set aside in Step 4) in a pan over the oven vent to gently melt the butter in preparation for Step 11. After 30 minutes, set dough on a lightly floured cutting board (not your counter-top) Use a floured chef’s knife to trim away 1/4″ of dough from each side of square; discard (or form into an extra, mis-shappen biscuit). Cut the dough into 9 squares, flouring the knife after each cut. Arrange biscuits at least 1 inch apart on the same parchment-line sheet pan. 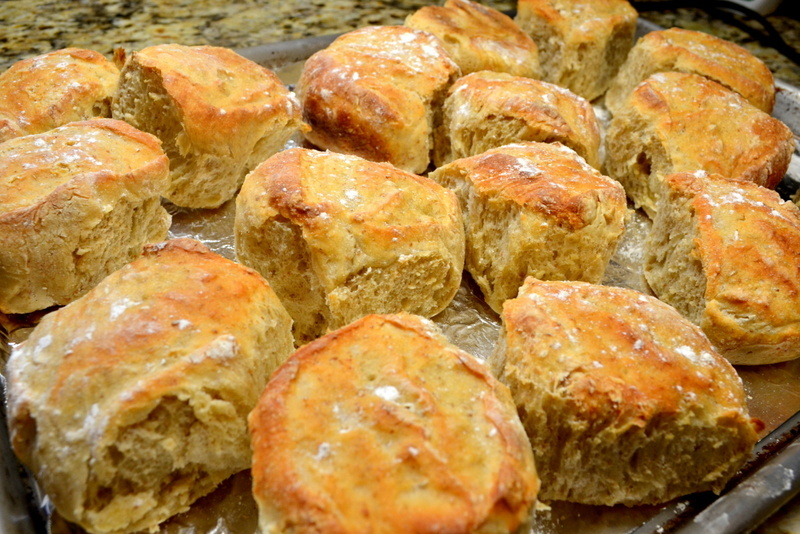 Brush the tops of biscuits with melted butter. Bake for 22 to 25 minutes, rotating biscuits halfway through baking, until the tops are golden brown. 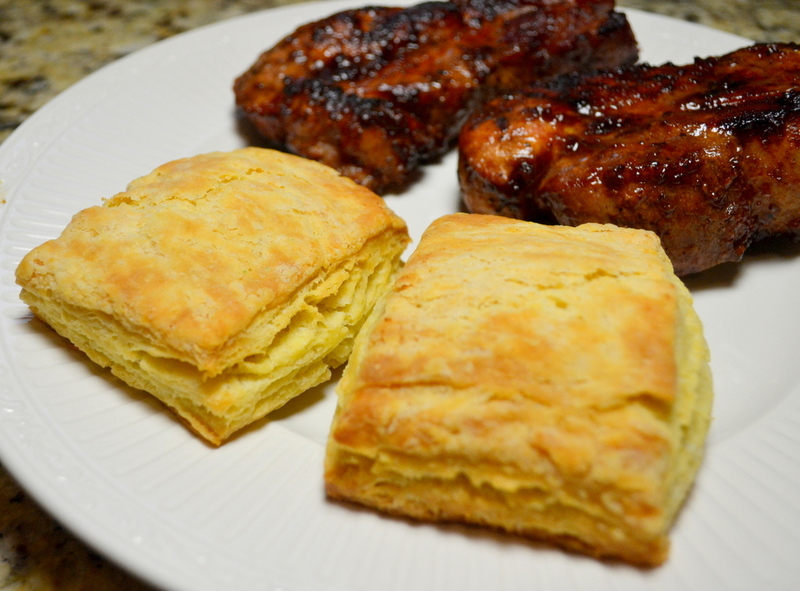 Allow the biscuits to cool for 15 minutes on a wire rack before serving. People travel for different reasons. I usually travels with two main goals. (1) Appreciate the local culture by trying to meet and interact with regular people (i.e. those outside the main-stream tourist industry). And (2), eat as much of the local food as possible. While my first goal is nearly impossible in well-trodden Paris, my second goal is always the Parisian-equivilent of a home run. Paris is perhaps the worlds great culinary city (see here, here, here, here, here, and here). I am not alone when I say that one of my favorite simple pleasures about Paris are the deliciously ubiquitous baguettes. Always warm and fresh; a Parisian treasure for just €1. Here in the US the baguettes are usually lacking in flavor or crusty texture, but if you are lucky they can sometimes be found. When this recipe first came out, I balked at the length, complexity and additional kitchen gadgets the recipe required (couche, flipping board, diastatic malt powder, and special lame). In the end, I didn’t buy any of the gadgets, but made the delicious baguettes over two-to-three days. They turned out amazing. 5-stars for flavor and texture. On a side note: the second great city for bread is my home town of San Francisco, which has the best sour dough bread in the world. As is the case for many things in life, it wasn’t until I moved away that I came to appreciate San Francisco’s uniqueness in the world of bread (for a few details see harvesting wild yeast for sourdough). 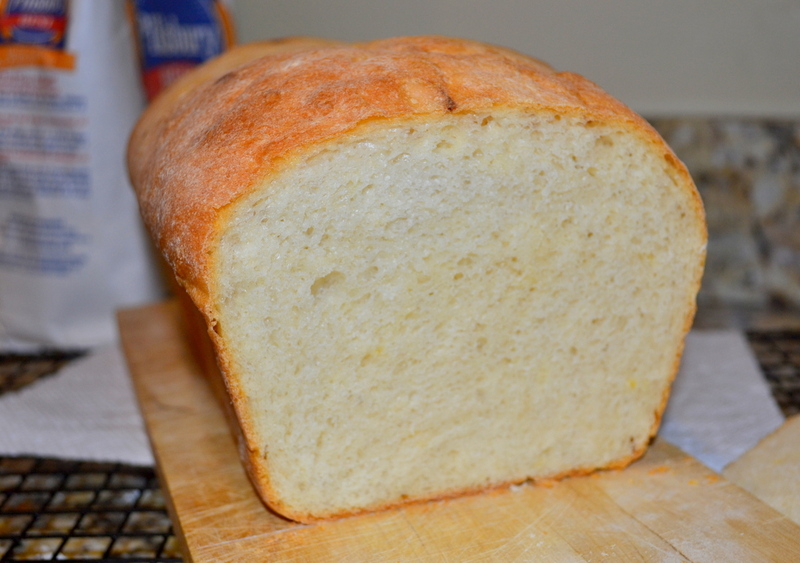 A few years ago, I bought a loaf of Sour Dough from Panera in New Jersey, but the loaf was soundly rejected by my boys. The recipe calls for a flipping board, but Chris Kimball explains that you can just table a double layer of cardboard. The first 5 minutes of baking call for two inverted disposable pans. Because I didn’t have one long enough to cover the loaves, I cut the ends off both pans which allowed it to slide like an accordion. The optional diastatic malt powder called for in this recipe allows the crust to brown and become crispier. Start: At least 2 days before baking. End time: 5 PM. Add whole wheat flour to a fine-mesh strainer and sift into the bowl of a standing mixer; discarding the bran. Add the all-purpose flour, salt, instant yeast and malt powder too. With the standing mixer on low-speed, use the dough hook, add the water and mix for 5 to 7 minutes until dough forms. Empty dough into a large bowl that has been lightly sprayed with non-stick vegetable spray. Cover with plastic wrap and allow to stand at room temperature for 30 minutes. Fold the dough over onto itself; pick up the edge of the dough with your fingertips and gently lift it towards the center of the bowl; turn bowl 45 degrees and fold again; repeating a total of 8 folds. Again, cover with plastic wrap and allow to rise for 30 minutes. Repeat folding and rising 3 more times. Immediately after the fourth set of folds, cover the dough and refrigerate for a minimum of 24 hours, but up to 72 hours. Lightly flour a counter and empty dough without deflating. Carefully pat into 8″-square, and cut in half. Refrigerate the other half of the dough which can be shaped and baked anytime within the 72-hour time frame. Cut dough in half again, leaving you with two 2″x2″ squares. Move to a lightly floured rimmed baking sheet and loosely cover with plastic wrap; allowing to rise for 45 minutes. Roll out each of the two pieces of dough into a 3″x4″-long cylinder. Return to the floured baking sheet, cover again with plastic wrap and allow to rise for 30 minutes. On a second baking sheet, lightly spray with water the underside of a couche or piece of parchment. Dust the top with flour. Return the dough to a lightly floured counter and gently press one of the pieces into a 6″x4″ rectangle. Fold 1-inch over to form a 6″x3″ rectangle, then fold the other 1-inch edge over to form a 6″x2″ rectangle, and gently stretch into an 8″x2″ rectangle. Fold dough in half again, lengthwise, and use your thumb to form a crease along the center of the dough, as you work your way folding over the length of the loaf, using the heel of your hand to reinforce the seal (without pressing down on the loaf). Cup your hands gently over the center of the dough and roll it gently to tighten the dough (t should form a doggy-bone shape, i.e. wider at the ends). Continue to gently work the dough, beginning in the center, rolling and stretching, and working towards the ends, until the dough measures 15″ long and about 1-1/2″ wide. Roll the ends between the palms of your hands to form sharp points. Move loaf with the seam-side upwards onto the couche or parchment prepared in Step 4. Pleat the couche on both sides of the loaf which will gently help the loaf maintain its shape. Loosely cover with large, unscented plastic garbage bag. Repeat Steps 5 though 8 with the second piece of dough, then move the loaves inside the large trash bag and fold top over onto itself to close. Allow to rise for 45 to 60 minutes, until it has doubled in size. You should be able to gently poke and the dough will slightly spring back. Meanwhile, set a rack to the middle of your oven, put a baking stone or overturned sheet pan, and begin pre-heating to 500-degrees. Also line a pizza peel with 16″x12″ piece of parchment paper, so that the long edge is perpendicular to handle. Remove and dough from bag and pull the ends of the couche to flatten (ie, removing the pleats). Use a flipping board to roll so that it is seem side down, and tilt/flip the loaf on top of the flipping board. Move to parchment lines pizza peal with the seem-side down; about 2″ from the edge of parchment. You can use the flipping board to straighten the loaf. Repeat with the second loaf, leaving at least 3″ between the two loaves. Use the lame to make a series of three 4″-long, 1/2″-deep slashed at a 30-degree angle across the length of the loaf. The slashes should slightly overlap. Repeat the slashing on the second loaf. Use Pizza peel to move loaves and parchment onto baking stone. Use the inverted disposable pans to cover loaves and bake for 5 minutes. Then carefully remove the plans a continue baking for 10 to 15 minutes longer; rotating the loaves/parchment half way through baking. The loaves will be done when they are evenly browned. Allow to cool on a rack for at least 20 minutes, but be sure to consume within 4 hours. I was able to extend their freshness by a few hours by putting them in a plastic bag after 2 hours of cooling. Rolled into 4-ish inch cylinders. I wanted to make delicious dinner rolls for Thanksgiving, but wanted a recipe that would work within the tight oven schedule of Thanksgiving day. So for this special dinner I combined recipes and techniques from a few different breads that I have made in the past (see here, here and here). I included a biga for great depth of flavor; which I started on Monday night. On Tuesday night, I made a wet dough so that I wouldn’t have to knead it by hand, since my KitchenAid mixer broke a few years ago (see “Autolyse”). After a few hours rising, I refrigerated the dough to stop the yeast from rising. When dealing with a wet doughs they are much easier to handle when chilled. Because dinner rolls take a bit of handling, the 36-hours in the refrigerator made the shaping process easy. Overall, the rolls were delicious. However, the subtitles added by the biga are largely overpowered by the small amount of rye and wheat flour. 4-stars. Because I was pulling this recipe from a lot of different places, I tested out the recipe a week prior to Thanksgiving. But the rolls were too small; perhaps because of beer, which I have noticed tends to retard rising. I abandon that recipe, and came up the this recipe to solve the problems that I had encountered. Yay! I finally ordered a new KitchenAid standing mixer. It had gone on sale for $225 at Target.com. The difference between their Professional and Artisan series is the steel gears of the professional series are more durable when making a lot of dough. My test batch of dinner rolls from last week also reminded me how quickly they became hard; within just a few hours. Unless you are going to eat them right away, you must keep them wrapped in plastic. If using a separate container for rising, do not attempt to do the mixing and rising directly in the same container. It is impossible to properly mix the dough anyplace other than a regular bowl. The recipe yielded too much dough, so next time I will cut down on the recipe by about 15%. Cost: $1.25 for 16 rolls. Started: 10:30AM pm Ready: 12:00. 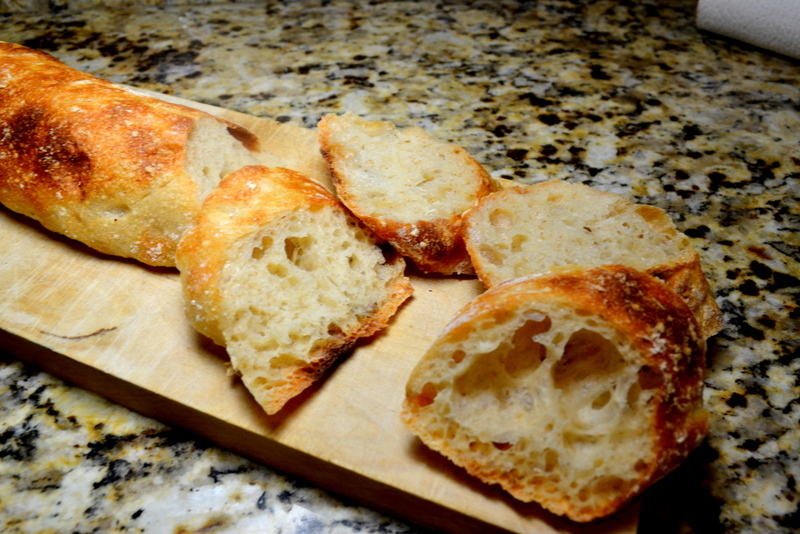 Make the biga the night before baking the bread; combine flour, yeast, and water in medium bowl. Use a wooden spoon to stir for 1 minute until the mix appears uniform. Use plastic wrap to cover and allow to stand overnight at room temperature. If you kitchen is much below 70-degrees, then you can use a slightly warmed oven (but turned off) which will ensure there is sufficient warmth. 2-cups water, preferably non-chlorinated spring water. Preheat 2-cups water to 100-degrees; about 45 seconds in the microwave. Add yeast and kosher salt to warm water, allowing it to hydrate while measuring out the flours. Add biga to a large bowl. Place bowl on a kitchen scale and zero out; you want to add a total of 22-3/4 ounces of flour. Add rye and whole wheat flour. Add all-purpose for a total of 22-3/4 ounces. Mix until combined, but without kneading. Empty the dough into a 4-quart container and let sit at room temperature until it has almost doubled in size; between 2 to 4 hours. Put container in refrigerator until ready to use. The dough is very wet, so allowing it to cool completely will make it easier to work with. Line a baking sheet with parchment paper and sprinkle evenly with a very thin coat of flour. Carefully remove dough from bowl onto a lightly floured surface. 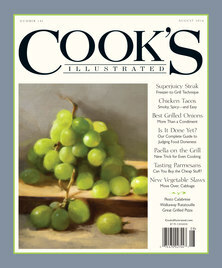 Cut the dough in half with a bench scrape or chef’s knife and carefully stretch each piece into a 24”-long cylinder. Cut each cylinder into quarters; then cut each piece into two (yielding a total of 16 evenly-sized pieces). If you slightly squished the cylinder as you made each cut, restore its roundness. Put 8 pieces of dough in each cake pan with the cut-side up; placing one piece of dough in the center and the other seven pieces like the spokes of a wheel. Set an oven rack to the middle of your oven and pre-heat to 500-degrees. Cover pans with plastic wrap and allow the rolls to rise for about 30 minutes until they have double in size. You can also test it because the dough will spring back if you gently press with your finger. Discard plastic wrap and lightly spray the rolls with water. Bake for 10 minutes until the rolls are brown. Turn the oven down to 400-degrees. Remove rolls and turn them out onto a rimmed baking sheet. After 5 or 10 minutes the rolls will have cool enough to handle, pull them apart and place on baking sheet. Bake at 400-degrees for 10 to 15 minutes; rotating the pan half-way through baking. They should have a deeply golden crust, and sound hollow if you tap their bottoms. Allow to cook on a wire rack for 30 minutes to an hour before serving. At this time of year pumpkin is everywhere. My oldest son is a fanatic for Pumpkin Pie, but I wanted to give him an alternative to his favorite dessert. This bread is a quick bread (i.e. uses making powder/soda instead of yeast), and has all the traditional seasoning for a pumpkin pie. While the ingredient list is long, I had everything in my kitchen already. 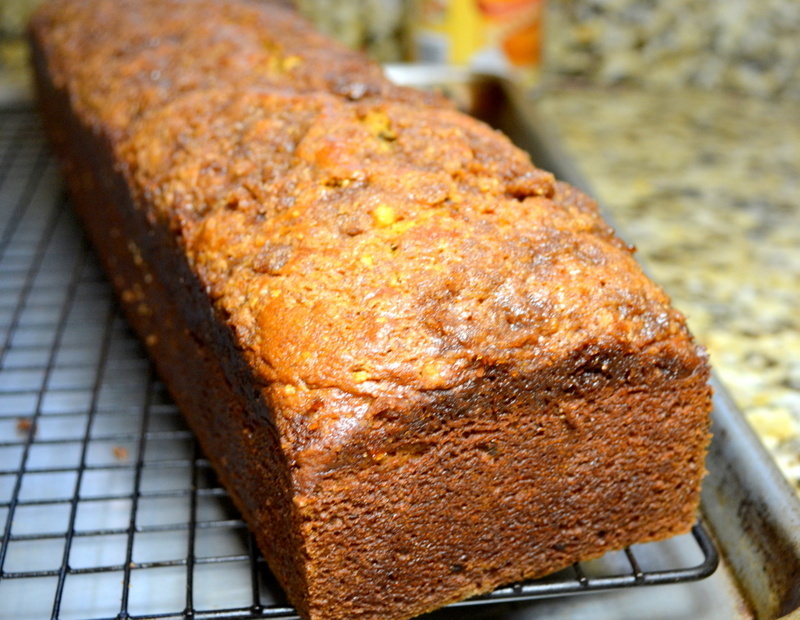 The recipe makes a wonderful seasonal alternative to banana bread. Surprisingly, my pumpkin-fanatical son only had two slices. Hmmm, go figure. Overall the recipe yields great pumpkin-pie-flavor, a moist interior with a perfect hint of sweetness on top. 4-stars. IMPORTANT HALLOWEEN TIP. How to prevent squirrels from eating your pumpkins. Chris Kimball recommends two 8-1/2″ by 4-1/2″, but I think most people only have 9″x5″ loaf pans. The resulting loaves will be a bit squatter and will need to be check 2 to 3 minutes earlier. I could only find 1 of the 2 necessary 9″x5″ loaf pans, so I substituted my Pullman loaf pan (18″x4″), which made one long loaf instead of two shorter ones. The substitution of pans lengthened the baking time by 2 to 3 minutes. While I recently made homemade pumpkin puree by roasted my own sugar pumpkin, today I used a can of Libby’s. One of the motivations of this recipe was to remove the raw, metallic flavor of canned pumpkin, so I wanted to test the effectiveness of that element of the recipe too. It worked. Start time: 2:00 PM. Ready at: 5:00 PM. To prepare the topping, add all the ingredients in small bowl. Use your finger to mix until well combined. It should resemble wet sand. Set it aside until Step 7. Cut your cream cheese into 12 pieces. Toast 1 cup walnuts an a small, dry skillet then chopped fine. Set aside. Set a rack to middle of your oven and pre-heat to 350-degrees. Grease two 8-1/2″ by 4-1/2″ loaf pans. Put a large saucepan over medium burner, add pumpkin puree, salt, cinnamon, nutmeg, and cloves. Cook and stir for 6 to 8 minutes until it is reduced to 1-1/2 cups. Remove saucepan from heat and add granulated and brown sugar, 1/2 cup vegetable oil, cream cheese. Stir until combined and allow to sit for 5 minutes. Use a whisk until there is no longer any visible cream cheese. It should appear homogenous. In another small bowl, whisk together the 4 eggs and 1/4-cup of buttermilk. Add into the saucepan with the pumpkin and whisk until combined. Fold in flour mixture from Step 4 until generally combined, but a few small lumps of flour are alright. Fold the chopped walnuts. Use a rubber spatula to evenly divide batter into the two prepared pans. Evenly sprinkle the topping from Step 1 over both loaves. Bake in the 350-degrees oven for 45 to 50 minutes until a skewer inserted into the center of the loaf comes out clean. If you are using 9″x5″ loaf pans, then you should star checking for doneness 5 minutes earlier. Allow bread to cool in the pans set on wire rack for 20 minutes, then remove bread from pans and allow to cool for another 1-1/2 hours. The bread can be served either warm or at room temperature.